Have a fun and exciting 20-minute ride around Biscayne Bay on a Banana Boat. Take in sights of Downtown Miami as you sail by on your yellow float. Hang on and enjoy this thrilling Banana Boat Ride! 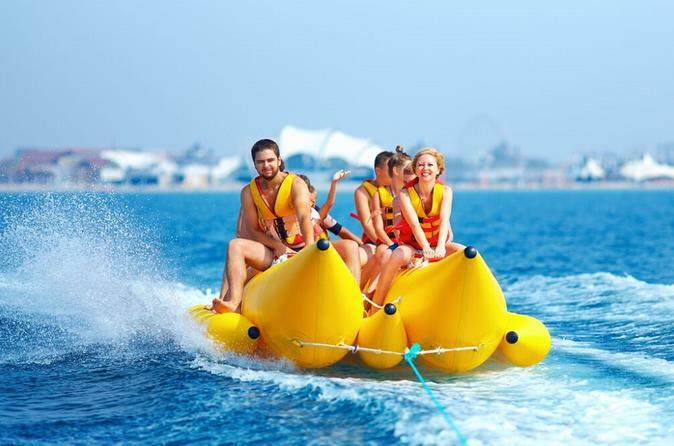 Select the best time to go out on the Banana Boat and brave the water. Make your way to Jet Boat Miami, which is located at 1635 North Bayshore Drive. Put on plenty of sun screen and your life jacket, and then ride out into the bay to begin your 20-minute Banana Boat ride. Try not to slip off of the Banana Boat as you glide through the water. Enjoy the gorgeous sights of Downtown Miami as you fly past. Ride the Banana Boat by the Sea Isle Marina and all of the boats. Have a thrilling and unique ride around Biscayne Bay on a Banana Boat!